"A Dream without a Plan is a Wish." A dear man who I worked for a few years back used to say this along with many other words of wisdom. He died a few weeks ago and I've often thought about him in the last few days. This quote seemed appropriate on a notebook I'm using to capture in one place all the ideas I have for blog entries, classes, designs, etc. Plato was certainly a man who lived his plan and made dreams come true for himself, his family, and his employees. I often use this type of notebook from Office Max. It is 6" x 9 1/2" and is ruled on one side of each sheet and gridded on the other. Perfect for sketches, ideas, and to-do' lists. I always do a cover with designer paper and some flat embellishments. They get a little haggard or "loved" over time, but they are so much prettier than an ordinary notebook. And it is much easier to find buried on my coffee table or desk! 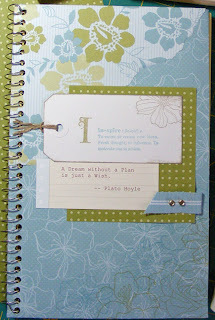 Ingredients for notebook cover above: Designer Paper all from Stampin' Up! Green Tea and Notebook. Gold brads and Baja stripe ribbon also from Stampin' Up!